This section of Carmine Street is included in the National Register nomination for the South Village Historic District. Both Erica, and I joined the Greenwich Village Society for Historic Preservation (GVSHP) this summer as research interns working with their Director of Preservation, Amanda Davis. Our primary focus was to work on a long overdue project known as “Building Blocks” which catalogs every building in the East Village neighborhood of New York City. Although our project was narrow in focus, we had many opportunities to expand our internships and contribute to the organization, while learning about the operation of a local preservation advocacy organization. 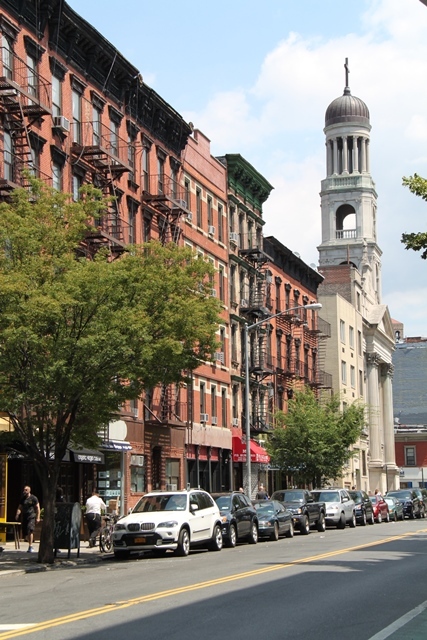 GVSHP is a small preservation advocacy group that covers the area of Manhattan that includes Greenwich Village, the East Village and NoHo. In their goal to preserve the character of these neighborhoods, they propose and support efforts for downzoning, landmark designation and listing on the National Register of Historic Places. The organization also assists with public research inquiries, holds an educational program series concerning local history and has numerous special initiatives concerning preservation in these neighborhoods. The project Erica and I were hired for is known as Building Blocks. 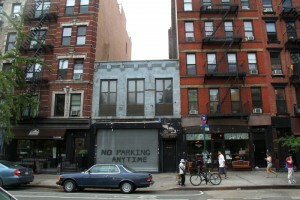 It consists of a website that will include information on every building lot in the East Village. This project, which has been making slow progress for the better part of a decade is based on research that has largely been completed, but not translated into useful building descriptions. As past interns have mostly been undergraduate students outside of the preservation field, GVSHP chose two Columbia Historic Preservation Graduate Students to advance the project over this past summer. While we brought the project close to public launch, we were also able to help the organization in ways beyond this single project. In addition to our work on Building Blocks, Erica and I have been able to assist the organization in some of their regular activities and ongoing projects. We conducted building research concerning GVSHP’s efforts to designate an area known as the South Village as both a New York City Landmark historic district and a National Register historic district. We handed out flyers and stickers at the public hearing for the South Village district at the Landmarks Preservation Commission. While working on these projects I also photographed numerous buildings and organized the photographic documentation for inclusion in the National Register nomination. This building in the East Village was home to New York’s first pasteurization laboratory. The building is the subject of an Off The Grid blog post by Erica Mollon. Erica and I regularly attended hearings at the Landmarks Preservation Commission to monitor the certificate of appropriateness applications in GVSHP’s areas of concern. We also gave testimony on these applications to state the GVSHP Preservation Committee’s view on the nature of these alterations. As interns we also served as guest contributors to GVSHP’s daily blog called Off The Grid. While at GVSHP both Erica and I were able to build on the building research skills and architectural knowledge acquired in our first year at Columbia, as well as gain valuable experience in the activities and projects of a local level preservation advocacy group. Perhaps equally as important, we spent our summers helping to preserve an area of New York that helps define the city’s unique character. Thanks, Bill! Honing our research skills was a great experience, and our internship really let us do that. I also loved getting to experience part of the Local Landmarking process and the State and National process with the work in the South Village. Plus, getting to interact with the public and understand their concerns and priorities for the historic neighborhoods was an learning experience you can’t get in a classroom.